In some Central European Floras Larix decidua var. carpatica is included with L. decidua var. polonica. Endemic to Poland where it mainly occurs in the headwaters of Wista River, West Carpathians. The naturally occurring larches in Poland (a country where this tree has been used in forestry extensively) appear to be in scattered remnants of ancient woodland, often restricted to one or a few mature to senescent individuals. The variety has also been found in the N-facing valleys of the West Carpathians, where a few stands remain that appear to do better (Vidakovic, 1991). In the ancient woodlands at lower elevations regeneration is poor and competition from other trees, mostly angiosperms, high. The population (here excluding larches south of the border/watershed with Poland, which are treated as Larix decidua var. carpatica) is apparently in decline. This taxon occurs in ancient woodland remnants in the lowlands or hills, where it forms small stands or is reduced to solitary, often senescent or dying trees surrounded by birches, oaks and other trees. In the uplands further south it can form small stands where larch dominates. The ancient woodland remnants are changing through succession and were probably more open with past forms of woodland management and use, benefiting larch. This may be a phase that is now past return, unless artificially restored. Undoubtedly this variety was logged in the past, but remaining trees are now mostly within small forest reserves. This variety is very limited in its distribution and the localities mentioned in the literature that could be trusted are few, probably only 3-5. Some mapped occurrences by Ostenfeld & Syrach Larsen (1930) on the Wista near Warsaw and even beyond are more probably based on introduced larch trees than on natural subpopulations. The localities discussed and photographed are all near each other where “single specimens” are mapped and these are vouchered by herbarium collections. Its AOO is certainly below the threshold for EN and likely much smaller. Trees were dying in the first quarter of the twentieth century, others were senescent, and there was little or no regeneration but much competition from other trees. Continuing decline puts this variety in the Endangered Category. 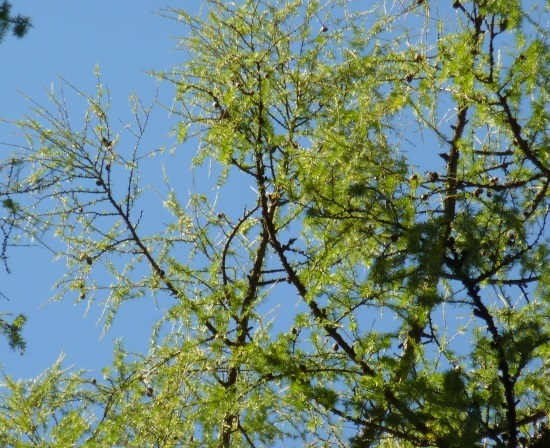 Competition from surrounding angiosperms in the lowland stands within ancient woodland; possibly also genetic contamination from planted larches (mostly L. decidua var. decidua) nearby. Most of the remaining trees and stands are within protected areas such as Świętokrzyski National Park. Anonymous. 1994. Red Book of the Ukraine. Ukrainska Encyclopedia, Kiev. Farjon, A. (2013). Larix decidua var. polonica. In: IUCN 2013. IUCN Red List of Threatened Species. Version 2013.1. <www.iucnredlist.org>. Downloaded on 08 July 2013. Oltean, M. and Negrean, G. et al. 1994. Lista rosie a plantelor superioare din România. 52(2): 52. T.Christian,and A.Farjon, 2015. Larix decidua var. polonica, from the website, Threatened Conifers of The World (http://threatenedconifers.rbge.org.uk/taxa/details/1016).